College students are one category of people who are a growing community in LinkedIn network. Students are aware of the scenario that LinkedIn is important and they need to be active. They need to be present in the digital media for a number of beneficial reasons like internships and their first job. Being a college student, a digital presence is mandatory for recruiters to glimpse through at times of recruitment. It is good to develop and maintain a student profile before you get graduated. Phrases and keywords are the few important facts that can be used in the profile in order to pull them out initially during LinkedIn job search. The following mentioned are few LinkedIn tips to create LinkedIn profile for students that help them in their job search and guide them towards a successful career. The best beneficial part of LinkedIn network is the prompt growth of connections. The best asset of LinkedIn is the massive user list. With LinkedIn you can have two connections or you can have hundred connections. College students who know how to use LinkedIn can have access to thousands. There are just two or three degree, where second degree users are friends of friends and third level of degree is where people get to know your friends. In this manner growing network with LinkedIn is useful for college students. With the help of introduction feature in LinkedIn you can find a contact and develop a network with the firm you’re interested in. This feature is useful for college students who desire to get to any company for internship, project or training. You can view the connection between you and the patient and then make use of an introduction form and request an introduction. The connection takes the responsibility and decides if it can pass it along. There is no pressure amongst students for an awkward request or meeting an unknown individual. Interesting contents and job postings are posted on the home page of LinkedIn. Though LinkedIn is not a job board completely a number of job hunting and hiring takes place on LinkedIn and hence college students can get to know what’s happening in the industry. For college students who are about to graduate and require a job can click and view the company profile, the students can also see the profile of the job poster. Check out and see if your connected, if not send an introduction so that you’re associated. When all these are not done just upload your resume and cover letter. College students are benefitted with LinkedIn as their credentials are offered directly into the job posters hands. College students should remember that getting linked with groups is yet another way to highlight them. LinkedIn groups are the best way to network in a quick and easy way without meeting any people or requesting an introduction. College students should be aware of groups, as groups are formed from industries, according to your profile, clubs and associations, college affiliations, etc. College students can join these groups and take part in discussions so that they can get to know more about career line and opportunities available. This is yet another opportunity LinkedIn offers for college students to show off their talent. Talents who design apps, make professional videos, design work, write and lot more can add their work and other accomplishments to their profile. The profile section is another useful feature for college students and they should make best use of them. College students should make sure to fill the projects, courses, certifications, languages and organization sections with appropriate keywords for them. For updating every section in LinkedIn profile, students cannot be obscure and random. When you’re updating the skills and endorsement sections, the students must make sure to add infrequently used keywords so that you’re at the top of the search results. Relevant keywords can be found out by browsing the job listings and make use of. Apart from being searched, your skills are endorsed by your connections too. So networking plays a great role in your career when you add the right skills with the right keywords. With endorsements you can also get people to write recommendations so that your viewers can see. Recruiters look for profiles which have recommendations from people. College students who have developed LinkedIn profile can set email alerts so that they can receive notifications regarding jobs or training appropriate to their career. By this way their home page will have notifications once they login to their LinkedIn profile. Being college students, LinkedIn can help you get linked to various students and groups so that you can get to know ample updates. Being students you can develop many stuffs in LinkedIn such as fields of study pages, Alumni tool, university pages, decision board for students, university finder and lot more are beneficial in many ways. College students should make sure that they fill up all the fields in the LinkedIn profile and never leave it incomplete. In that manner the courses they have studied and excelled in must be listed out. They should make sure that they fill the latest and highly demanded courses, languages in the sections provided. This will grab the attention of other recruiters or officials. In the same manner they can also mention that they have volunteered any assignment, or task in their college. College students should be aware that they need to get linked with professionals for various future tasks such as internships, training, jobs etc. Almost all your friends, co-workers and lot more can be found on LinkedIn. Connecting with people on LinkedIn is quite simple and easy. College students can import email list and find out the ones who are present on LinkedIn. For a future employer, co-worker or others to know about you, a punchy profile headline is necessary. The headline can be succinct with your excitation, your desire to do in future or something informative. To get more ideas students can check out the profiles of others or from recent alumni. So make sure to have a powerful headline in order to get noticed. Being a college student, you should make sure to update and keep your LinkedIn profile up-to-date like a perfect professional profile. Students should think that your profile is always viewed by someone and hence adding recent updates, skills and jobs are important. The LinkedIn profile summary is yet another fact which is similar to a cover letter and presents message about you. Having a clear professional and perfect summary for LinkedIn is important. Skills and achievements that are relevant to the students must be added. Do not save your profile until you proofread the profile many times. For students who are looking out for an entry level job or for an internship in their favorite company can search for the company on LinkedIn. You can get to see the content, the company has posted which can help you to know more when you reach the company for training. You can also get to know who in your network is connected to the company. Hence college students can get to know more details about the company they desire to work or enroll for training. College students should make sure that LinkedIn is a passive resource for job and networking purpose. It is always a positive point for college students to post interesting articles or ideas about industries as it stands to be a good way for comments and interactions with plenty of connections who have similar interest. There are chances where people who comment may not help you but someone they are linked with can help you. Connections are made easy and simple with LinkedIn. 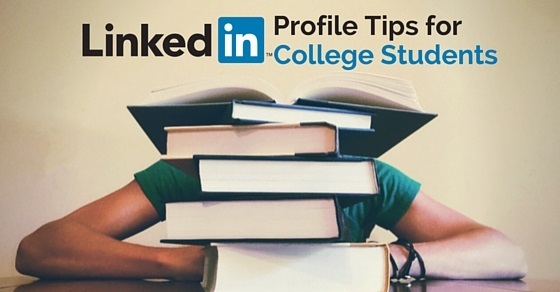 These are a few LinkedIn tips for college students in developing and utilizing LinkedIn. There are many benefits of LinkedIn for college students who make use of this social network. College students who do not have a LinkedIn profile can develop one and follow all the LinkedIn tips and tricks so that they are identified easily by top recruiters for training or job purpose. When you use LinkedIn in a professional manner you can establish new connections, explore multiple organizations, industries and develop more relationships. This can be an initiating point for job opportunities for college students. Hence it is mandatory for college students to develop a professional LinkedIn profile and maintain it till the end. Adding relevant skills, in the sections which are currently prevalent, demanded and is important for users of LinkedIn. Hunt online and glimpse through the number of successful LinkedIn profiles to get an idea of writing the same. Step forward in your career with the perfect LinkedIn profile.